Did you know that Philadelphia was for 10 years, 1790-1800, the capital of the United States whilst Washington and the District of Columbia were being created? And did you know it is the second largest city on the east coast, albeit with a population of 1.5m, somewhat smaller than New York. It is a city of American firsts, including its library (1731), hospital (1751), medical school (1765), stock exchange (1790), zoo (1874), and business school (1881). Maybe the word ‘capital’ is wrong, but it is still the chief city of the United States when it comes to history. It started by being British. In 1682, William Penn founded the city to serve as capital of what was to become the Pennsylvania Colony. As a Quaker, Penn had experienced religious persecution and wanted his colony to be a place where anyone could worship freely. He laid the city out in a grid form. It is difficult to get lost. 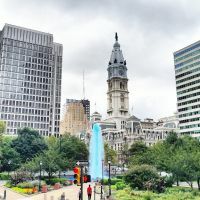 Philadelphia is notable for its rich history; the Liberty Bell, Independence Hall – where the Declaration of Independence and Constitution were signed – and other American Revolutionary sites. No less iconic are the steps of the Philadelphia Museum of Art, immortalized by Sylvester Stallone’s triumphant run in the film "Rocky." It was in the Carpenter’s Hall Philadelphia in 1774 that the first Continental Congress met. Getting to Philadelphia is easy. You can fly, Delta Air Lines is the latest airline to come onto the route from Heathrow, and with a Virgin Atlantic codeshare. It is a short ride from the international airport to Downtown. Alternatively, New York is 100 miles to the north and Washington, 140 miles down the turnpike. Amtrak links the three cities. And once settled in take the “Big Bus” tour with real live conductors giving the prefect introduction to the cradle of America. 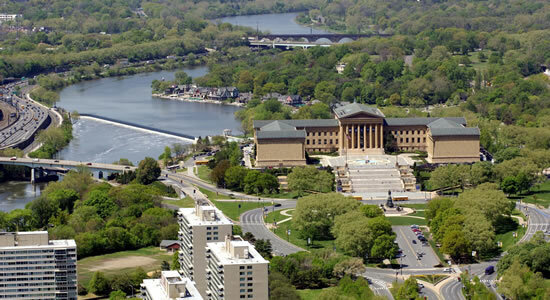 The Philadelphia “City Pass” gives you access to a whole host of historical buildings and places of interest. BTN stayed at the 4-star Sonesta Hotel, comprehensively remodelled, with a rooftop pool for summer use. On Market Street, Philadelphia’s major thoroughfare, it is within walking distance of the majority of historic sites. Benjamin Franklin, the city’s favourite son, is buried in the grounds of Christ Church, part of the Philadelphia’s Pass historical walk which takes you by his actual house. 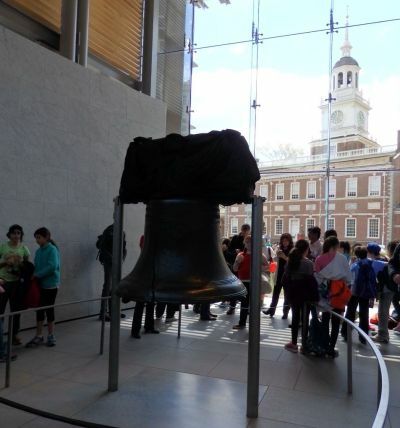 The whole area is rightly named “America’s Most Historic Square Mile,” with the Liberty Bell, an iconic symbol of US independence accommodated, central in the beautifully designed Liberty Bell Centre. 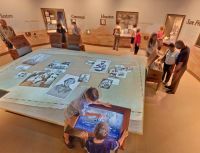 The National Museum of American Jewish History is close too. You start on the top floor and walk down symbolic ship gangways to the next ‘deck’ where you are welcomed with a short film of what you are about to see at that level. Not far away is City Hall with the statue of William Penn at its top. For many years no building could be constructed higher than what is the world’s tallest masonry structure. City Hall is the largest municipal building in the United States, containing over 14.5 acres of floor space. It is an architectural treasure inside and out. The public rooms are among the most lavish in the City. The City Council Chamber, the Mayor’s Reception Room, Conversation Hall and the Supreme Court Room are the most ornate. The Barnes Foundation on the Benjamin Franklin Parkway is outside the central area of the city, and a stop on the bus tour. The collection includes 181 paintings by Renoir, 69 by Cézanne, 59 by Matisse, 46 by Picasso, 21 by Chaim Soutine, 18 by Henri Rousseau, 16 by Amedeo Modigliani, 11 by Edgar Degas, seven by Vincent van Gogh, and six by Georges Seurat. Enough said. Some of the artists were/are controversial as is its new home opened in 2012. It is an imposing and outstanding structure. 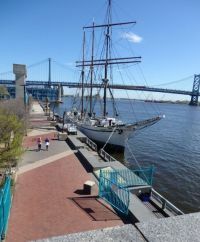 Whilst it is over 60 miles along the Delaware River from the sea Philadelphia was once a major trading port and navy base. Today it is the home of the Independence Seaport Museum, the oldest US steel warship the USS Olympia, and the World War II submarine Becuna. Across the river (accessible by ferry during the summer) is the Philadelphia-built battleship New Jersey, also a tourist attraction. Ship buffs will know the port is the current home of the US United States, the world’s fastest liner, its future still unknown since its withdrawal from service in 1969. Resurrected it would add to the tourist attractions and once again be a competitor to the Queen Mary! 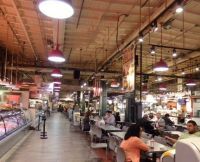 When it comes to dining Philadelphia comes into its own with the Reading Terminal Market the place to start the day with breakfast. Don’t forget that in the US hotels are normally ‘room only’. In what was the space under the now closed main railway station over 80 independent merchants offer fresh produce: meats, fish, cheese, groceries, ice cream, flowers, baked goods, ethnic foods, crafts, books, clothing, and lots of places to eat. Philadelphia’s most dramatic dining room, R2L sits 500ft above the city on the 37th floor of Two Liberty Place, featuring wall-to-wall unobstructed, breath-taking panoramic views that span for over 40 miles. The food is pretty good too. The City Tavern sums up Philadelphia, the replica of a historic 18th-century building located in Independence National Historical Park very much in the city centre. 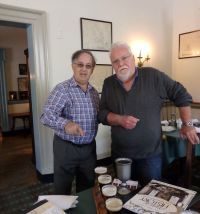 Owner and Executive Chef Walter Staib cooks a variety of entrees using authentic 18th-century recipes, served in seven period dining rooms, three wine cellar rooms and an outdoor garden. It is a meeting of period and modern. You dine very well. ‘FLYING AT THE FRONT END’ in Delta One, Delta Air Lines business class product, is planned for next week. I think you meant to write that the SS United States was withdrawn from service in 1969 not 1996. Otherwise a nice synopsis of the city where I grew up.